jointed, or cut-through ; for upholstery in them does not seem to have commended itself to this designer to any very great extent, as he introduced it but very rarely. When he did make use of this comfortable addition, it was usually on the lines indicated by Fig. 9, Plate II. In order to convey a still more adequate conception of the true characteristics of the " Heppelwhite" chair, various forms of arms which constantly recur are given in Figs. 13, 14, 15, 16, 17, and 18 on the same plate. The essential difference between these and the typical "Sheraton" arm can be discovered at once by comparing these forms with those illustrated on Plates I., II., and III. 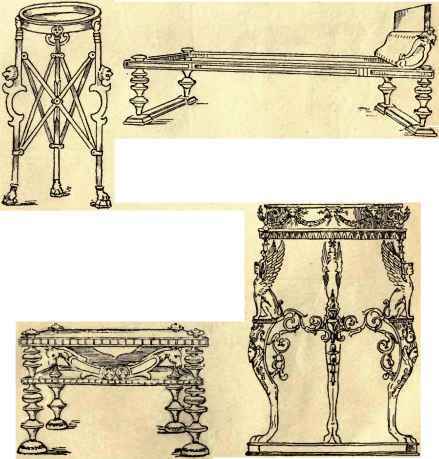 in my chapter on "Sheraton/' The arms proper in the latter style are nearly always shaped in a graceful curve, or series of curves, "springing" from the back; but they are supported in front, where they terminate, by upright, turned pillars^ which are really continuations of the front legs, the design of which is carried up into them. The " Heppelwhite " arm, though apparently very similar to the "Sheraton" to the casual observer, is, in reality, altogether different. It resembles the "Sheraton" insomuch that it usually comes down from the back in a single curve, more or less pronounced; but, instead of being supported in front by the turned " upright," another curve, nearly always concave, but sometimes serpentine, carries it down to the top of the front legs, where they join the seat-frame. That this rule is not absolutely invariable will be seen by reference to Fig. 15, Plate II., and Fig. 9, Plate III. in "Sheraton," but those two examples may be regarded as exceptions. The shaping of the "Heppelwhite" arm is sometimes extremely subtle and, I think, charming, as, for instance, in Figs. 17 and 18, Plate II. Small upholstered pads were frequently introduced in both styles.